When I last wrote about Justin, he was thirteen and going into seventh grade in middle school. (*See link below.) He still mostly used a wheelchair, required a one-on-one aide at school, his vision was quite limited, and unless I used a huge marker board to help him with homework, reading independently was impossible. But even considering these issues, with our NACD program he had achieved far more than others had expected from a child diagnosed with cerebral palsy. At age 4 Justin had had a surgical procedure called a selective dorsal rhizotomy (not at NACD’s recommendation) and lost the muscle tone and strength we had worked so hard to improve, which was a huge emotional blow to Justin’s confidence. The rhizotomy was the “in” surgery in the late 1980s, but the results for Justin were disastrous. Immediately following the surgery, Justin’s legs felt like marshmallows. Sure the spasticity was gone, but so was the good muscle development. And worse yet, I took Justin to the therapist for the follow up treatment where she stretched his legs, and in less than 24 hours I watched the spasticity begin to return. I was devastated and so guilt-ridden that I had made things worse. Yet even with this serious setback, by middle school, with the help of his NACD program, Justin had progressed beyond anything anyone had said he would, and I was hopeful the trend would continue. We worked with Bob and NACD for several more years and eventually decided to discontinue formal evaluations. My husband Bill, who had adopted Justin after our marriage, really thought I was not being realistic about Justin’s potential. It seemed to him that I needed to appreciate the gains Justin had made and move on. This is not to blame him, but to acknowledge that working an intensive program requires a strong support system. My solution was to do everything I could afford that might help Justin, without spending the number of hours each day true recovery required, in hopes that Justin would make some gains anyway. He had personal trainers for several years, which provided a great social outlet—Justin has always been a sports fan—so working out in a gym was perfect. Justin had fun and that helped me. I wasted other time and money, always in hopes of helping Justin. The unfortunate reality is that there are so many useless therapies out there; and those of us with hurt children will try most anything. We tried hyperbaric oxygen therapy and neurofeedback—neither was cheap—and neither improved Justin’s function enough to justify either the expense or time spent. Both made him calmer for a brief time. What I always believed was that since Justin was still just a young man, somehow I would get him to where he belonged. And the only person I knew who understood this was Bob. I kept this inside in hopes that someday something would happen to allow us to return to NACD. During his senior year in high school, Justin began working with a personal trainer who was a cyclist. He believed Justin could ride a hand cycle and participate in the upcoming El Tour de Tucson bicycle race. However, Justin did not need a hand cycle. With shoes bolted to the pedals, he rode a recumbent himself, and his trainer ended up riding the hand cycle Justin had been given. It took them 5.5 hours to do the 35 mile length of the race, the shortest leg you could do. (Justin later donated the hand cycle to a young man who had a spinal cord injury.) In addition, Justin was honored as the inspirational cyclist of the year and an article about him was published in the local newspaper. As a result, we received a call from a woman who was part of a National Science Foundation grant studying the efficacy of Reiki on children with cerebral palsy. She invited Justin to the clinic where she volunteered. It turned out Justin was much more functional than the children in the study, so she offered to teach Reiki to Bill and Justin so they could begin to volunteer too. After high school, Justin enrolled in a community college, earned an Associate Degree in General Studies, and began volunteering in several clinics, which allowed him to gain a different perspective on life. A couple of years ago, Bill and Justin’s volunteering led them to a clinic in Mexico that used neurodevelopmental work in treating hurt children. This led Bill to see the difference NACD can make in the lives of those children. He asked me to contact Bob. One thing we knew—Justin’s dream to drive and read had never gone away, and he wanted to drive without having to load a wheelchair into the vehicle. We thought Bob would be just the man to help. Justin was 18 months old when I took him to NACD for the first time. He was cortically blind, with pupils barely responding to light. Although Justin had made very significant progress with his vision with his NACD program, when we returned Bob told Justin that if he wanted to drive his vision would have to significantly improve and the first step would be to see well enough to read comfortably. This terrified me. Justin went through all his education never reading a book. I had no idea how to make this happen. But resuming NACD program jumpstarted Justin’s vision progress again. With Bob’s recommendation, we purchased a Kindle Paperwhite touch screen e-reader—a game changer—which allowed Justin to read much more easily due to its no glare feature. In October 2012, Justin read two-inch-tall print and had never read a book on his own; a year later he is reading regular 12-point font. Now Justin actually reads because he loves it. I cannot overstate what it is like for me to come into my home office and see Justin reading. Right now he is reading a book by David Kessler, former head of the FDA, about how the food industry manipulates sugar, salt, and fat to keep people wanting more. When Justin was little his left eye turned in, and with the implementation of the NACD vision exercises, by the time he was thirteen the strabismus had significantly reduced, yet was still noticeable. Now, after a year on program, the strabismus is almost completely gone. This is so amazing! When he was a baby, I remember being told he had optic nerve hypoplasia. I looked it up, only to find out he would probably never see. 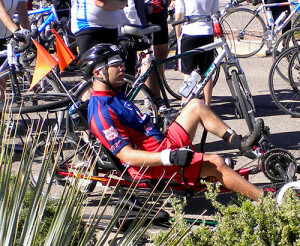 For the last several years, Justin and his dad have been training for and participating in the annual Tucson bike race, riding a recumbent tandem together. Bob reminded Justin that if he was sitting in the back of the bike he wasn’t using his eyes to see where they were going. Now, Justin rides 5 miles on an individual recumbent bike and is perfectly aligned with the winding, hilly road. I was terrified at first… he was all over the road! Now, he is just a regular rider, steady and parallel to the side of the road. Bob was right: using his eyes is improving his vision. 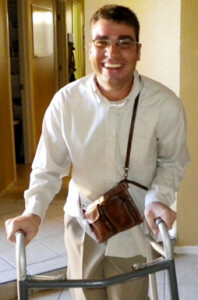 Although he is no longer a child, Justin’s brain is still learning and changing. Not too long ago it looked as if Justin was beating the dog when he was just trying to pet her. Now, he has normal tactility—and the dog is much happier, even standing next to Justin at his desk so he will pet her. With better tactility Justin can put clogs on, can almost put regular loafers on and off on his own, and is working on fastening buttons. He folds laundry and helps with dinner preparation. He loves making salads—takes great pride in this—and has figured out how to cut food by laying the fork on its side. He is working on cutting with a knife. I have no doubt he will be there soon. The truth is, I believe he will be able to do all these things, just like any other adult. Although he still occasionally uses a wheelchair in busy public places, Justin now walks most of the time. His gait is smooth, fast, and unbelievable to see. A year ago he couldn’t navigate stairs; now he goes up and down while keeping one hand on the railing for support. He continues to work out and doesn’t look at all like he was ever diagnosed with CP. He is so strong and buff that strangers often wonder why he is sitting in a wheelchair. We have been in the mall several times when people asked if he was a veteran, assuming the wheelchair is a recent event. When Justin was first diagnosed with CP, he was labeled mentally retarded. He is so far away from that now! In fact, his auditory sequential processing is at 9-10, reverse auditory 8-9, and visually he processes at 10, which is significantly higher than the ability of the average typical adult. More importantly, Justin is still progressing: just in the last three months, he has gained a year and a half in reading comprehension. Having an increased cognitive ability is having another positive impact as well. Until six months ago Justin had no good way of expressing frustration. He used to lash out physically when he became too frustrated. Because his tactility was low, he could easily bruise my arm just by grabbing it. He also had emotional meltdowns. Life was so frustrating that from time to time he would break down sobbing. Here was my son—the best gift I ever got— I sobbed with him with a broken heart. Now, he has the cognitive tools to express his irritation in a healthy, productive manner. He can calmly and rationally work through a problem and come up with reasonable solutions. Justin now behaves like most “normal” people. He is no longer that social misfit—just a tad off center—if you know what I mean. Now that Justin can do most things ‘normal’ people do, he enjoys the company of several close friends, including a girl friend with whom he chats in Spanish on Facebook. A friendship at Justin’s age is different from when he was younger. His friends have families, jobs, and responsibilities, but they still make time for Justin. They run errands together, go out for coffee, and bond over sporting events. Justin is also keeping busy with volunteering at two different clinics a few times a month. He is a skillful Reiki master, who brings comfort and healing to others, and at the same time gets to experience healing himself. When we visited with Bob recently, Justin mentioned again that he would really like to drive. 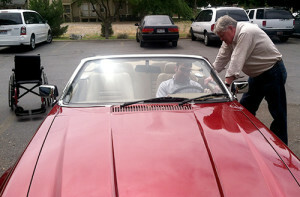 Not realizing just what that would do for Justin—or maybe precisely because he did—Bob took Justin out to the NACD parking lot and invited Justin to sit in the driver’s seat of his prized, classic red Jaguar convertible. Then, very carefully, very patiently, Bob taught Justin how to start the car, apply gas and brake, then guided Justin into putting the car into gear and slowly backing out and into the parking spot. The look on Justin’s face was priceless. Having tasted a bit of how it feels to drive, Justin is determined to keep on working the program—with Bob’s loving, patient guidance—to make the dream of driving a reality. Since starting program anew a year ago, Justin has become a changed human being. One year ago, Justin’s idea of conversation was asking questions. And to make it even more awkward, he would first ask permission to ask a question, essentially asking two questions each time. Despite the fact that he is my son, for whom I am so grateful, this was difficult to handle for more than a few minutes at a time. Contrast that with our conversation yesterday when we talked about the current book he is reading. Or consider that a couple of days ago this former game show junkie was completely engaged in a news conference that interrupted “The Price is Right”—the show he watches with pinhole glasses. He could not have handled that interruption even six months ago. Six months ago, he could not tell you what he thought about something—he needed you to tell him why something was. No more. He can begin a sentence with “I think that…,”“I wonder if…,” or “Did you know that…?” The amazing changes we’ve seen in him over the last twelve months have proven that even a mature brain can continue to create new connections. Outside the world of neurodevelopment that NACD has opened up for us, some people may think that we are imagining things, that we are fooling ourselves, but that’s okay. They don’t understand what’s possible. The truth is, while doing his NACD program Justin’s vision hasimproved dramatically in the last year and he is reading a lot and loving it. His fine and gross motor functions have greatly increased and walking and driving a car are viable expectations now. Most importantly, Justin knows that it is never too late to grow, and change, and improve. That’s the real difference—Justin knows! Last week a co-worker asked me if I thought Justin would ever live on his own. It was easy to say “of course.” The truth is, I always believed that Justin would end up with a great life. I’ve known Bob since Justin was 18 months old. It took me awhile to get Justin back to him, but this time my husband is not simply okay with it, he helps Justin with program too. Justin’s gains are happening because we are back where we belong—with NACD—and the support system is strong. Never in my life could I have imagined the pain of my only son being born severely brain damaged. Even with that, I was always so grateful he was mine. That has never changed. And the reason I can tell our story is because of Bob. We are truly fortunate. Despite graduating from high school in the National Honor Society and completing an Associate’s Degree, at nearly 30 years of age, Justin had never read a single book. I rationalized his loss by telling myself that he was an auditory learner with poor vision that prevented him from reading. While Justin did not seem to be bothered by the fact that he could not read, he continued to dream of driving—what guy doesn’t? I knew of only one person who could give him that chance. After an evaluation from Bob in October of 2012, we began program once again. Bob insisted Justin would need to learn to read independently if he ever wanted to drive a car. Terrified of being disappointed, we followed the program Bob wrote and bought a Kindle Paperwhite. Bob also insisted Justin not simply read books of his choice, but rotate his choices with classical literature. And just like that, Justin began reading independently. In truth, I was thrilled he was reading at a 7.5 reading level six months later. Three months after that, however, he had only gained another 3 months growth. This is when Bob said that Justin needed to really hit the working memory activities in Simply Smarter. Justin did the reverse auditory activity multiple times a day for the next few weeks. Three months later his reverse auditory span was 5 and his reading comprehension level jumped 1.4 years. So he continued focusing on two activities–reverse auditory and alphanumeric. Six months after that, his working memory had nearly doubled and he gained 2.2 years in reading comprehension.The table below tells the entire story. Hit reverse auditory really hard! Eighteen months ago, Justin had never read a single book.Today he can read anything that interests him. The change in Justin from increased working memory is not limited to reading. He is aware of and interested in the world around him. For the first time in his life, he has current knowledge about the world we live in. He enjoys comedy. And he loves reading. We call him a reading maniac! At age 31, he is a new person. Most important of all—he is hopeful about his future and believes he will drive one day.